Autumne Franklin made her senior year one to remember, for herself, for Harvard, and for the Ivy League. As a former hurdler myself, I know personally how it is a challenge to be successful across three different hurdling distances – the indoor 60m to the outdoor 100m and 400m – let alone defending your conference title for multiple years. But Franklin has made it appear so easy. 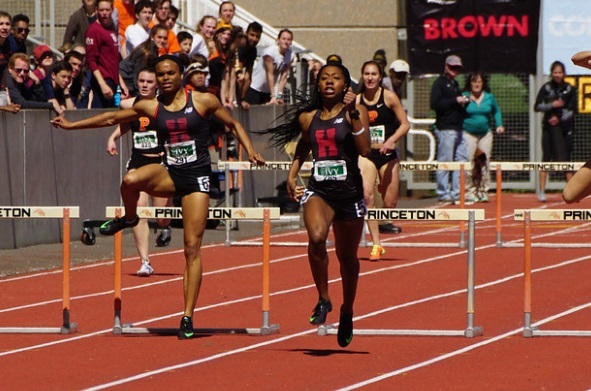 She’s a part of a few different elite Ivy hurdling clubs now. She’s the fourth woman to ever sweep all hurdling titles in one year, joining Brown’s Susan Smith (1991 to 1993), Harvard’s Brenda Taylor (1999), and Columbia’s Kyra Caldwell (2010). She’s the second woman to ever four-peat in the outdoor 100m hurdles, joining Smith (1990 to 1993). But when you look at her times, you could argue she is the best overall hurdler that this conference has ever seen: she’s the second-fastest ever in both the 60H (8.41 – 2015) and 100H (13.44 – 2016) and the fastest ever in the 400H (54.91 – 2016). And that 400H time gave her First-Team All-American honors this past June (fourth overall). In addition to having some of the fastest marks in conference history in those three events, she’s made her mark in conference history in the 400m, 4×100 relay, and 4×400 relays (and that is just this year alone). She’s been honored with the Female Track MVP awards from both the Indoor and Outdoor Heps, partially because she four-peated in the short distance hurdle events, but also because she won the open 400m at Indoor Heps only 15 minutes after she won the hurdles, and was a key contributor to the conference winning sprint relays at both championships. All of this has kept the Crimson winning team championship after team championship these last four years. We should keep an eye out for Franklin on the pro scene these next few years. She was sixth at the Olympic Trials this past year – setting a new PR of 54.65 in the process and missing Team USA by 0.5 seconds. We expect to see her racing again for another Team USA berth in 2017. Dana Giordano (Dartmouth) – Giordano is officially faster than her former teammate, Abbey D’Agostino. Over the course of the outdoor season, Giordano improved her 1500m time by 8 seconds – 6 of those seconds just during the NCAA Outdoor Championships – as she set a new school record in the event (4:11.86) to finish 3rd in the NCAA final. That time is also the second fastest in conference history behind Cornell’s Stephanie Best (4:09.83). In addition to that massive personal best, Giordano graduated from Dartmouth with a total of 8 Heps titles – three in the 1,500m; three in the 3,000m; one in the mile; and one in the outdoor 5,000m. She’s the only woman in Ivy League history who has won both the 1,500m and 5,000m in the same championship, in addition to three-peating in the 1,500m. She joined Yale’s Lindsey Donaldson in being the only women to three-peat in the indoor 3,000m so far. She’s talented on the grass fields as well, as she has competed three times at the NCAA Cross Country Championships, including the 2015 edition as she won the Northeast Regional qualifier, earning the USTFCCCA honor of the Northeast Region Female Athlete of the Year. This entry was posted on Friday, December 30th, 2016 at 4:00 pm. It is filed under Athletes, Awards, Spotlight. You can follow any responses to this entry through the RSS 2.0 feed.